This tote can store everything you need for the beach, pool & more! The Chelsea Initial Jute Tote features a burlap material with a monogrammed initial right in the center, Cotton web handles and side rope ties for adjustable size. 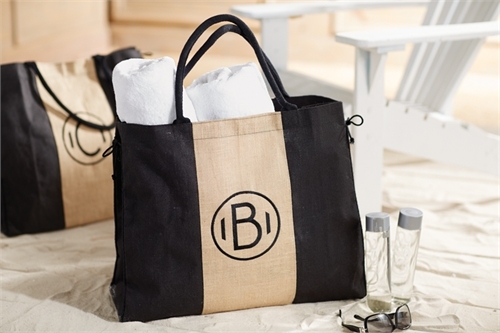 This tote can store everything you need for the beach, pool & More! The Chelsea Initial Jute Tote features a burlap material with a monogrammed initial right in the center, Cotton web handles and side rope ties for adjustable size, a magnetic snap button on the inside to keep it closed , and a small inner pocket.